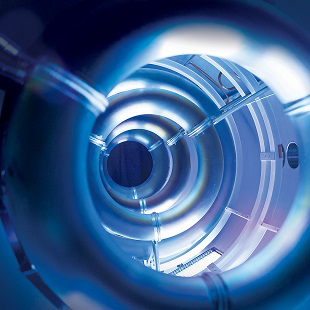 Lockheed Martin's Skunk Works division is five years away from a full-blown fusion reactor prototype. Lockheed Martin's Skunk Works division is responsible for some of the most important aircraft ever built, including the U-2 spy plane, SR-71 Blackbird, and the F-117 stealth bomber. You can add "fusion reactor revolutionary," to its list of accolades, it seems. A team within Skunk Works is hard at work on project "T4," also known as the compact fusion reactor (CFR), a fusion reaction experiment that was originally announced back in 2013. The CFR could, if successful, truly change the world, and how it both produces and consumes power. Currently the size of business jet engine, the current CFR design has aircraft in mind, but could easily be reworked for use in a spacecraft, or as a power source to replace nuclear or coal power plants. The project team is led by aeronautical engineer Dr. Thomas McGuire, an MIT alum who is using the project to combine the best nuclear fusion ideas into one, functioning device. "I started looking at all the ideas that had been published," said McGuire in an interview with Aviation Week. "I basically took those ideas and melded them into something new by taking the problems in one and trying to replace them with the benefits of others. So we have evolved it here at Lockheed into something totally new, and that's what we are testing." The concept of fusion reaction is nothing new -- it's been around for nearly a century, in fact -- but Lockheed's design is the first that overcomes the plasma beta rate problem. Current designs have a beta rate (the ratio of plasma to its confining pressure) of about five percent, or 20:1 (pressure:plasma). McGuire and his team think they can increase that number to 100 percent, or a 1:1 ratio. That's an exponential increase in potential power, which also means smaller fusion reactor designs are possible without being anemic. A jet engine-sized reactor for an airplane, or a house-sized reactor for a city or town. Or perhaps even a smaller model to power that crazy airplane laser Lockheed developed. Lockheed hopes to have more complete prototypes within five years, and a commercial product in ten. For now, since I'm no nuclear physicist or aeronautical engineer, go check out the full breakdown over on Aviation Week for yourselves.